Heavy duty hardboard is water resistant for up to 72 hours and provides excellent temporary floor protection for any hard surface including wood, tile, marble, and concrete. This hardboard is quickly replacing Masonite as a temporary surface protector because it is faster, less expensive, and easier to handle. It rolls out flat making installation simple. Made from 100% recycled materials. 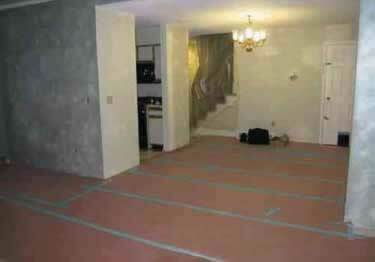 Need to cover a larger space? Just use the hardboard water resistant seaming tape to help you customize to the size you need. 72 Hour water resistant hardboard with 44 mil thickness provides superior protection for wood, concrete, marble, tile, or any hard surface. Vent Dust Covers let you run heat or air while keeping construction dirt, dust and debris from entering duct work.